Die US-Weltraumagentur NASA berichtet, dass ein sehr gr0ßer Teil der Oberfläche des Eises auf Grönland angetaut ist. Seit den letzten 30 Jahren, seit dem dieser Prozess mit Satelliten beobachet wird, war das Ausmaß des Antauens noch nie so groß. Bisher war im Sommer das Eis auf etwa die Hälfte von Grönland angeschmolzen, nun sind es aber 97%. Die Nasa zeigt zwei Satellitenaufnahmen von Grönland: Einmal die Situation am 8. Juli 2012: Etwa 40 Prozent des Oberflächeneises auf Grönland ist angetaut. Vier Tage später ein total anderes Bild: Am 12. Juli sind nun 97 Prozent der Oberfläche angetaut. Die Ursache für das Abschmelzen ist möglicherweise eine Hitzeglocke über Grönland. Hiervon gab es seit Mai 2012 mehrere, jedesmal war die nachfolgende Hitzglocke jedoch heftiger als die vorherige. Die zuletzt beobachtete Hitzeglocke baute sich am 8. Juli auf und begann sich am 16. Juli aufzulösen. Ob diese Ereignisse einen Einfluss auf das Volumen des Eisverlusts in Grönland haben werden, ist nicht klar. Das meiste Wasser gefriert wieder schnell in großer Höhe und in Küstennähe wird ein Teil des Wassers von Eisbarrieren zurückgehalten, dadurch fließt nur wenig Wasser in das Meer. 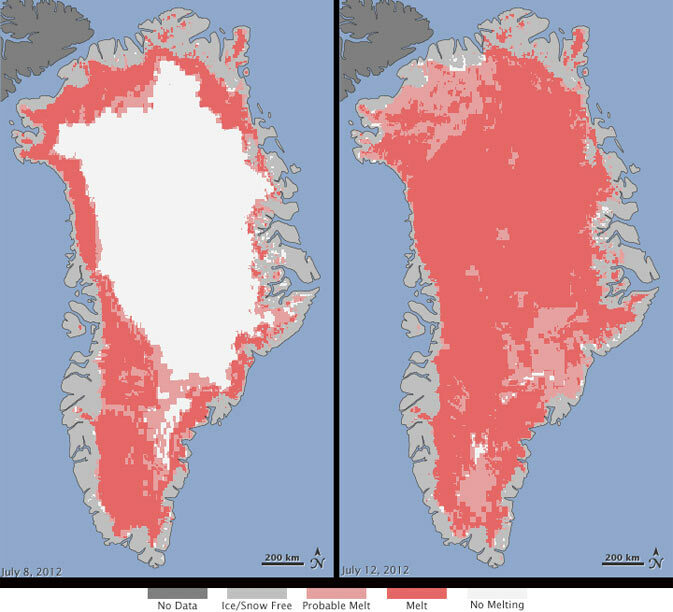 WASHINGTON — For several days this month, Greenland’s surface ice cover melted over a larger area than at any time in more than 30 years of satellite observations. Nearly the entire ice cover of Greenland, from its thin, low-lying coastal edges to its 2-mile-thick center, experienced some degree of melting at its surface, according to measurements from three independent satellites analyzed by NASA and university scientists. This extreme melt event coincided with an unusually strong ridge of warm air, or a heat dome, over Greenland. The ridge was one of a series that has dominated Greenland’s weather since the end of May. „Each successive ridge has been stronger than the previous one,“ said Mote. This latest heat dome started to move over Greenland on July 8, and then parked itself over the ice sheet about three days later. By July 16, it had begun to dissipate. Wasser als wichtiger Faktor im Ökosystem und als Lebensmittel Nr. 1 spielt bei der Umweltforschung der EU weiterhin eine große Rolle. Im Jahr 2013 will die EU Forschungsprojekte im Bereich Umwelt mit 330 Mio. € fördern. 98 Mio. € davon sollen davon in die Förderung von Forschungsvorhaben in den Bereichen Frischwasser und Wasserressourcen fließen. 155 Millionen € sind für die Forschungspriorität „Der Ozean von morgen“ reserviert. Diese Gelder sollen zur Verbesserung der Nachhaltigkeit im marinen Sektor eingesetzt werden. Die Europäische Kommission hat die letzte Ausschreibungsrunde im Rahmen des 7. EU-Forschungsrahmenprogramms (7. FRP) veröffentlicht. Mit einem Fördervolumen von insgesamt 8,1 Milliarden € für Forschungsprojekte und -ideen ist diese Ausschreibungsrunde die bisher höchstdotierte im 7. FRP und nimmt den Hauptteil des EU-Forschungshaushalts 2013 von 10,8 Milliarden € ein. Die Aufforderungen zur Einreichung von Vorschlägen umfassen eine große Bandbreite. Sie reichen von thematischen Forschungsprioritäten wie „Der Ozean von morgen“ (155 Millionen €), über „Intelligente Städte und Gemeinden“ (365 Millionen €) bis hin zu Förderprioritäten rund um die digitale Agenda im Bereich Informations- und Kommunikationstechnologien. Darüber hinaus finden sich auch Maßnahmen zur Intensivierung der Forschermobilität und Laufbahnentwicklung – die sogenannten Marie-Curie-Maßnahmen (963 Millionen) und Einzelzuschüsse des Europäischen Forschungsrats (1,75 Milliarden €) im Bereich der Pionierforschung. Für kleine und mittlere Unternehmen (KMU) steht ein Budget von ca. 970 Millionen € zur Verfügung. Neu ist die Initiative für „Lehrstühle im Europäischen Forschungsraum (EFR)“, die auf eine breitere Verteilung der Spitzenforschung in Europa abzielt. Mit einem Budget von 12 Millionen € sollen insgesamt fünf EFR-Lehrstühle unterstützt werden, die an Universitäten oder anderen förderfähigen Forschungsinstitutionen in weniger entwickelten Regionen sitzen. Das 7. FRP hat seit seinem Start 2007 bisher erfolgreich rund 19 000 Projekte mit insgesamt über 79 000 Beteiligten (Universitäten, Forschungsorganisationen und Unternehmen) in allen EU-Mitgliedstaaten gefördert. Das EU-Büro des BMBF bietet Ihnen hier eine Zusammenstellung aller aktuellen thematischen Arbeitsprogramme aus dem Bereich Kooperation an. Per Stichwortsuche können sie überprüfen, in welches Thema Ihre Projektidee passen könnte. Alle ausschreibungsrelevanten Unterlagen stehen auf dem Teilnehmerportal („Participant Portal“) der Europäischen Kommission zur Verfügung. Weitergehende Informationen zur Antragstellung erhalten Sie auf unseren Internetseiten und über die einzelnen zuständigen Nationalen Kontaktstellen in Deutschland. In addition, €75 million is dedicated to maintaining a sustainable supply of raw materials to the EU for its industry and society as a whole. Decreasing the EU’s dependency on imported resources will lead to a greener economy while fostering more sustainable consumption and production patterns. The EU will fund research that addresses key challenges facing Europe. For example, investment in research to preserve oceans and water, make better use of raw materials, develop smart cities and tackle issues such as improving the delivery of public services, brain research and anti-microbial resistance. Funding will also go to high-risk/high-gain „frontier research“ in all domains of science through European Research Council grants and to support individual researchers‘ careers through Marie Skłodowska-Curie Actions. Urban areas consume 70% of EU energy, and are responsible for 75% of the EU’s greenhouse gas emissions. Around €365 million will be invested to support innovation in energy, transport and information and communication technologies (ICT) to transform urban areas into smart, sustainable, low-carbon environments that are resilient to the impacts of climate change. Faced with volatile energy prices on the world market, coupled with concerns over security of supply, European industries and consumers are spending an increasing share of their income on energy. Every year 2.5 % of the Union’s Gross Domestic Product (GDP) is spent on energy imports, and this will likely increase. In 2010 alone, the cost to society of brain disorders in the EU and its associated countries was estimated by experts in the field to be around €800 billion. As Europe’s population ages, brain disease will become an increasing burden. To date, FP7 has invested €1.7 billion into leading international brain research to combat diseases like Alzheimer’s, depression, or schizophrenia which affect many millions of Europeans. The 2013 work programme will maintain a strong focus in this area with an investment of around €144 million. There will be a special focus on demonstration programmes on post-disaster (natural or man-made) or „aftermath“ crisis management and on „logistics and supply chain security“. The demonstration on aftermath crisis management will be the conclusion of over 40 projects financed by the security theme over the last five years. The demonstration on logistics and supply chain will tackle one of the central security challenges of the 21st century: the secure and efficient transit of goods around the world. This topic addresses possible attacks on supply chains, trafficking and contraband. Other topics of research will be linked to issues such as fighting forest fires, the fight against human trafficking, rescuing disaster victims and the use of social media in crisis management. By the end of the FP7 in 2013 the Commission will have financed over 250 security research projects, with more than 1,500 participants, from 45 countries. With over 21% participation by SMEs, the security programme largely exceeds the target for SME participation in the whole of FP7. Almost €1.5 billion has been earmarked to support information and communication technologies-related (ICT) projects in 2013. The EU will invest in research which strengthens Europe’s scientific and technology base, helps drive and stimulate product, service and process innovation and creativity through ICT use and ensures that ICT progress is rapidly transformed into benefits for Europe’s citizens, businesses, industry and governments. The European Research Council (ERC) will invest over €1.75 billion in the very best young and senior researchers, of any nationality, based in or moving to Europe, to carry out their pioneering frontier research projects. By supporting the very best talent in all areas – i.e. Physics and Engineering, Life Sciences and also Social Sciences and Humanities – the ERC contributes to creating new jobs for the research community in Europe. To date over 2,500 world class starting and advanced researchers have been funded including four Nobel laureates, three Fields Medallists and the winners of 30 more internationally recognised prizes. By the end of FP7 in 2013, it is estimated that the ERC will have awarded nearly 5,000 grants to individual top researchers. Through this ERC funding, around 16,000 PhD students and postdocs will also have been supported as team members. In addition, around €963 million will support researchers‘ mobility and careers through ‚Marie Skłodowska-Curie Actions‘ (MCA) for highly-qualified researchers. The MCA place a strong emphasis on gender balance – 38% of funded researchers are women. This diversity is also reflected in the origin of researchers, with more than 130 nationalities and host organisations in 80 countries represented. 50% of research supported by the MCA is dedicated to societal challenges such as the fight against cancer, climate change and energy scarcity. SMEs account for more than half of all businesses participating in the projects. By the end of FP7 in 2013, the MCA will have supported 50,000 researchers and 10,000 PhDs. „ERA Chairs“ are intended to help develop research excellence in regions with low levels of participation in framework programme projects. A pilot call is scheduled to select five „ERA Chairs“ in five different countries. The amount earmarked is €12 million. On average each grant will amount to €2.4 million. The ERA Chairs will be outstanding academics who are attracted by universities or other eligible research institutions which have a demonstrated potential for research excellence. This will permit these institutions to develop, in a selected field, the level of excellence required to successfully compete internationally and effectively widen participation. The details of the pilot call will be presented in the autumn. Bringing public and private actors closer together is also the purpose of the European Innovation Partnerships (EIPs) being set up under the Innovation Union action plan. The big challenges we face – such as climate change, energy and food security, health and an ageing population – also present opportunities for new business and the EIPs aim to give the EU a first-mover advantage in these markets. Up to five EIPs will be supported, including the EIP pilot action on Active and Healthy Ageing. In addition, the European Research Council’s small-scale initiative ‘ERC Proof of Concept’ will continue to help bridging the gap between ERC grant holders‘ research results and commercialisation. The ERC has also launched a „Goes global“ campaign, which aims to raise awareness about the competitiveness and attractiveness of European universities, laboratories and research institutes and to promote ERC funding opportunities. The campaign will continue up until 2014. By that time, the ERC will have targeted around 15 countries. The EU’s total research budget includes funds that are not used centrally through the FP7 coordinated calls but are spent in other ways, either under the Euratom treaty covering nuclear energy research (€993 million), or to help support „joint technology initiatives“ with industry (€751 million) or „joint programmes“ set up between Member States. The €8.1 billion figure goes 100 percent to projects selected following open calls for proposals. It does not include the in-house research activities of the Joint Research Centre, other forms of funding, like calls for tenders or the Risk Sharing Finance Facility (€150 million for Risk Sharing Instrument; €50 million for research infrastructures and suppliers), nor the cost of the research executive agencies or the administrative expenditure linked to selecting projects (recruitment of expert panels) and managing them. 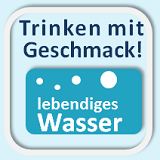 Die nachhaltige Produktion von Wasserstoff aus nicht-fossilen Quellen wird für eine zukünftige Wasserstoffwirtschaft dringend benötigt. Wenn wir Wasserstoff nachhaltig produzieren, speichern und in Brennstoffzellen effizient umsetzen könnten, ginge ein technologischer Traum in Erfüllung. Bis dahin müssen aber noch sehr viele höchst komplexe materialwissenschaftliche Probleme gelöst werden. Ingenieure und Chemiker arbeiten mit diesem Ziel im Materials Research Department der RUB (s. Info) zusammen. 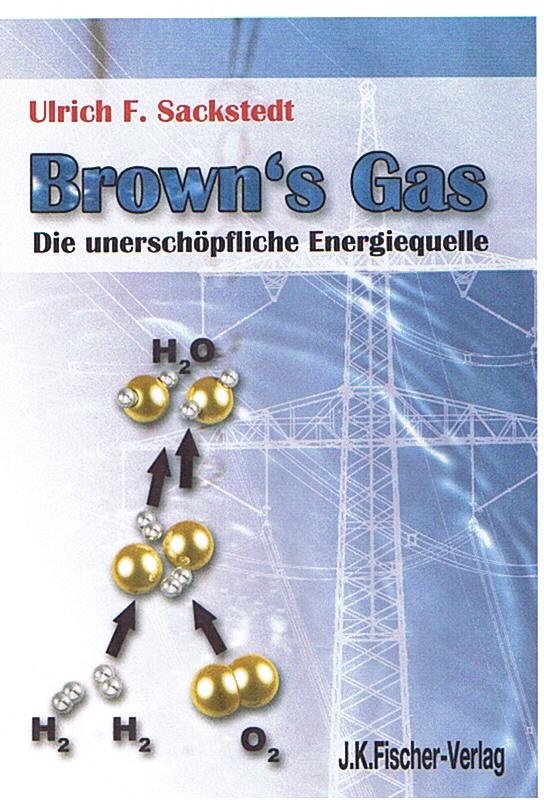 Eine faszinierende Möglichkeit Wasserstoff herzustellen, ist die photoelektrokatalytische Spaltung von Wasser (H2O) in Wasserstoff (H2) und Sauerstoff (O2), die bereits vor ca. 40 Jahren erstmals beschrieben wurde. Eine Funktionseinheit zur Wasserspaltung besteht aus zwei Elektroden, einem äußeren Kontakt und einer elektrisch leitfähigen Flüssigkeit (Elektrolyt), die den elektrischen Kontakt zwischen den Elektroden im Zellinneren herstellt (Abb. 3). 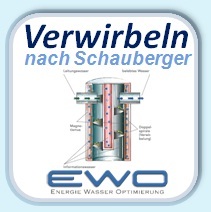 Bei der solaren Wasserspaltung findet an der Anode die Sauerstoffentwicklung und an der Kathode die Wasserstoffentwicklung statt. Die photoaktive Anode besteht aus einem halbleitenden Material: Es verfügt über ein sog. Valenzband, das mit Elektronen gefüllt ist, und ein sog. Leitungsband, das leer ist. Bei Energiezufuhr durch Licht werden negativ geladene Elektronen aus dem Valenzband energetisch in das Leitungsband angehoben. Zurück bleibt ein positiv geladenes Loch. Die Elektronen-Loch-Paare können durch die sich entwickelnde Photospannung voneinander getrennt werden, da sich Valenz- und Leitungsband in der Nähe der Oberfläche verbiegen und so ein elektrisches Feld entsteht, in dem sich die negativ geladenen Elektronen und positiv geladenen Löcher voneinander weg bewegen. Die Elektronen werden über einen äußeren Kontakt (z.B. ein transparent-leitfähiges Oxid) von der Anode zur Kathode geleitet. Dort können je zwei Elektronen in den Elektrolyten übertragen werden, um zwei H+-Ionen zu H2 zu reduzieren. An der Anode läuft ein entgegengesetzter Prozess ab. Hier können die Löcher im Valenzband der Halbleiterelektrode Elektronen aus dem Elektrolyten aufnehmen. 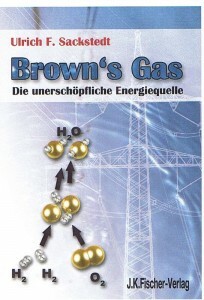 Dabei wird H2O unter Bildung von H+-Ionen zu O2 oxidiert. Der elektrische Stromkreis wird durch die Diffusion der H+-Ionen von der Anode zur Kathode geschlossen. Bisher ist es nicht gelungen, diesen Effekt in ein marktfähiges Produkt umzusetzen. Um eine technologische Nutzung zu ermöglichen, müssen zuerst neue Materialien entwickelt werden, an die höchst schwierige und vielfältige Anforderungen gestellt werden. Die gesuchten Materialien müssen nicht nur Halbleitereigenschaften aufweisen, um über den Photoeffekt das einfallende Licht nutzen zu können. Um effektiv möglichst viel Licht in chemische Energie zu wandeln, muss das gesuchte Material auch einen möglichst großen Anteil des solaren Spektrums absorbieren. Diese Anforderungen ähneln zum Teil denen von Materialien für die Photovoltaik. Sowohl die angeregten Elektronen im Leitungsband als auch die Löcher im Valenzband müssen zur Oberfläche des Halbleiters diffundieren, wo die Elektronen für Reduktionsreaktionen und die Löcher für Oxidationsreaktionen zur Verfügung stehen. Folglich muss das Material nicht nur die Lichtquanten optimal absorbieren. Die Energieniveaus des Valenz- und Leitungsbandes müssen auch an die gewünschte Reaktion angepasst sein – die sog. Bandlücke zwischen den beiden darf weder zu groß noch zu klein sein. Materialien mit zu kleiner Bandlücke sind oft instabil und korrosionsanfällig. Für die Anhebung der Elektronen bei einer zu großen Bandlücke hat das Sonnenlicht nicht ausreichend Kraft. Da elektrochemische Prozesse immer an einer Phasengrenze zwischen einem Elektronenleiter und einem Ionenleiter stattfinden, müssen die gesuchten Materialien für die solare Wasserspaltung zusätzlich in einem Elektrolyten und bei langandauernder Bestrahlung mit Sonnenlicht über ihre Einsatzdauer, d.h. über Jahre, stabil sein. Diese Beständigkeit zu gewährleisten ist ein großes Problem. Jeder kennt den Effekt, dass Gegenstände, die über einen längeren Zeitraum der Sonne ausgesetzt sind, ausbleichen und altern. Natürlich sollten die gesuchten Materialien darüber hinaus möglichst ungiftig, gut verfügbar und preisgünstig sein. Alle diese Anforderungen sind zudem zum Teil gegenläufig: So sind Materialien, die einige erforderliche Eigenschaften gut erfüllen würden, eben nicht beständig genug. Im Materials Research Department verfolgen wir zur Entwicklung neuer Materialien für die solare Wasserspaltung das folgende Konzept: In der Gruppe von Prof. Ludwig (Werkstoffe der Mikrotechnik) werden Dünnschicht-Materialbibliotheken hergestellt (siehe Beitrag Seite 18). Diese Materialbibliotheken umfassen eine Vielzahl wohldefinierter, unterschiedlicher Materialien, z.B. Metall-Oxynitrid-Systeme, die in einem einzigen Experiment hergestellt werden. Die zu untersuchenden Materialien werden auf eine Platin-Dünnschichtelektrode abgeschieden. Die so hergestellten Materialbibliotheken werden dann gemeinsam mit den Gruppen Schuhmann und Muhler auf ihre photokatalytischen Eigenschaften hin untersucht. In der Arbeitsgruppe von Prof. Muhler (Technische Chemie) werden mögliche Materialien für die Wasserspaltung auf ihre Katalysatoreigenschaften untersucht. Photokatalysatoren dienen dazu, die Energiebarriere, die am Anfang einer Reaktion steht, zu überbrücken und die gewünschte Reaktion damit energiesparender zu ermöglichen. Das Halbleitermaterial, z.B. Titandioxid (TiO2), muss wie oben beschrieben in der Lage sein, Licht zu absorbieren, wobei Elektronen-Loch-Paare entstehen. Wichtig ist, dass die gebildeten Elektronen und Löcher an die Oberfläche diffundieren können, ohne vorher zu rekombinieren und sich somit gegenseitig auszulöschen. Die entstandenen Elektronen werden von Co-Katalysator-Nanopartikeln (meistens Edelmetalle wie Rhodium, Platin, Gold) aufgenommen und reduzieren an der Oberfläche des Co-Katalysators Wasser zu Wasserstoff (s. Abb. 4). Simultan oxidieren die Löcher an der Oberfläche des Halbleiters Wasser zu Sauerstoff. Dementsprechend entsteht während der Bestrahlung ein Gemisch aus Wasserstoff und Sauerstoff in einem Verhältnis von 2:1. Ob ein Katalysator für die Wasserspaltung geeignet ist, wird in einem Dreiphasenreaktor untersucht: Der Katalysator liegt in Form von nicht-löslichen (dispergierten) Feststoffpartikeln vor, Wasser ist die flüssige Phase und der Reaktor wird von einem reaktionsträgen (inerten) Trägergas durchströmt, das die entstandenen Gase Wasserstoff und Sauerstoff zur Analytik transportiert. Der eingesetzte Vielkanaldetektor erlaubt die kontinuierliche Bestimmung der Konzentrationen der gebildeten Gase, sodass die Aktivität des Katalysators ermittelt werden kann. Die Herausforderung liegt darin, ein hochaktives und stabiles System für die Wasserspaltung mittels sichtbarem Licht zu finden. Die Arbeitsgruppe von Prof. Schuhmann (Elektroanalytik und Sensorik) widmet sich derweil der Messung des Photostroms an den unterschiedlichen Materialien in Abhängigkeit einer angelegten Spannung. Je höher der Photostrom ist, umso größer ist das Potential des Materials, Wasserstoff erzeugen zu können. Anfänglich wurden dazu die Dünnschicht-Materialbibliotheken zersägt und die so erhaltenen Proben einzeln untersucht. Bei diesen Experimenten gibt es oft Überraschungen; so lösen sich z.B. Materialien gelegentlich einfach auf, wenn sie in einem ungeeigneten Elektrolyten gemessen werden. Der Elektrolyt ist notwendig, da reines Wasser einen zu hohen elektrischen Widerstand aufweisen würde und der Stromkreis so nicht geschlossen wäre. Das eigentliche Ziel des Projektes ist es, ein Material zu finden, das ohne eine äußere elektrische Spannung Wasserstoff erzeugt. Zu Beginn des Projektes bauten wir eine einfache Anlage zur Messung des potenzialabhängigen Photostroms für Einzelproben auf und testeten es an einem Referenzsystem. Dafür wählten wir Wolframoxid (WO3) als Referenzmaterial. Von WO3 ist bereits bekannt, dass es passende Halbleitereigenschaften aufweist und dass es außerdem auch noch stabil in den meisten wässrigen Lösungen ist. Allerdings sind auch bei WO3 noch einige Aspekte unklar, die einer genaueren Betrachtung bedürfen. So war der Einfluss der WO3-Schichtdicke auf den Photostrom noch nicht geklärt. Bei relativ großen Schichtdicken wird das eingestrahlte Licht aufgrund des vergrößerten Absorptionsvolumens besser ausgenutzt. Gleichzeitig nehmen allerdings auch der Schichtwiderstand und die Wahrscheinlichkeit einer Rekombination von Elektron-Loch-Paaren zu. Beides bewirkt eine Abnahme des Photostroms. Es ist eine nahe liegende Vermutung, dass sich diese Effekte so kombinieren, dass ein maximaler Photostrom aus einer optimalen Schichtdicke resultiert. Um diese optimale Schichtdicke zu finden, wurden mittels reaktivem Magnetronsputtern WO3-Proben (Abb. 5) mit einem Schichtdickengradienten hergestellt. Die Farbe der einzelnen Bereiche hängt dabei nicht nur vom Material ab, sondern, aufgrund von Interferenzeffekten auch von der Schichtdicke. Da die Herstellungsparameter großen Einfluss auf die Mikrostruktur der Dünnschichten haben, wurden die Schichtdickengradienten bei unterschiedlichen Prozessgasdrücken des Argon-Sauerstoff (Ar/O2)-Gasgemisches von 3 bis 40 x 10-3 mbar abgeschieden. Bei einer konstanten Spannung von 1 V zeigen die Photostrommessungen (Abb. 6) eine ausgeprägte Abhängigkeit von der Schichtdicke und vom Prozessgasdruck. Zwei Fälle können unterschieden werden: Messkurven mit einem Maximum bei niedrigen Schichtdicken (~200 nm) und Messkurven mit einem Maximum bei großen Schichtdicken (~500 bis 600 nm). Die Maxima im Photostrom bei niedrigen Schichtdicken treten in den Proben auf, die bei niedrigen Drücken (3 und 13 x 10-3 mbar) abgeschieden wurden. Diese bestätigen auch die Vermutung, dass eine optimale Schichtdicke existiert, welche für WO3 bei ca. 150 bis 200 nm liegt. Allerdings scheint die optimale Schichtdicke wiederum eine Abhängigkeit vom Kammerdruck bei der Herstellung des Materials aufzuweisen. In den Proben, die bei höheren Drücken gesputtert wurden, steigt der Photostrom kontinuierlich und erreicht ab ca. 500 nm eine Sättigung. Dieses Verhalten konnten wir mit Hilfe der Transmissionselektronenmikroskopie (TEM) erklären. Die TEM-Probenquerschnittsaufnahme einer bei 40 x 10-3 mbar abgeschiedenen WO3-Schicht lässt fadenartige Poren erkennen, die senkrecht zum Siliziumwafer verlaufen. Diese Poren bilden sich durch den erhöhten Sputtergasdruck und vergrößern effektiv die chemisch aktive Fläche, die mit dem Elektrolyten in Kontakt steht. Die Vergrößerung der benetzten Grenzfläche zwischen Probe und Elektrolyt ist bei elektrochemischen Prozessen ein häufig eingesetztes Mittel zur Steigerung der chemischen Reaktionsgeschwindigkeit. Um eine effiziente Charakterisierung der Materialbibliotheken zu ermöglichen, haben wir in der Gruppe von Prof. Schuhmann die photoelektrochemischen Messungen automatisiert. Wir haben eine so genannte Rastertropfenzelle (Abb. 1 und 2) mit integriertem Lichtleiter entwickelt, der mit einer Xenonlampe verbunden ist. An die Probe kann die Spannung angelegt werden, während die Gegenelektrode und die Referenzelektrode in der Tropfenzelle die Strommessung erlauben. Eine Teflonmessspitze selektiert eine Fläche der Probe von ca. 0,5 mm Durchmesser, so dass eine große Zahl unterschiedlicher Materialzusammensetzungen auf einer von der Arbeitsgruppe Prof. Ludwig hergestellten Dünnschicht-Materialbibliothek untersucht werden kann (s. Abb. 7). Zwischen den Messpunkten kann mit einer angeschlossenen Spritzenpumpe der Elektrolyt automatisch ausgetauscht werden. Der Messaufbau ermöglicht es, eine komplette Materialbibliothek automatisiert auf ihre Photostromeigenschaften hin zu testen. Der Zusammensetzungsbereich, der dabei abgedeckt werden kann, wäre mit den zuvor vorgestellten Elektroden auf Waferstreifen nur unter hohem Zeit- und Materialaufwand erreichbar. Nun steht die Ausweitung der Forschungsarbeiten auf neue Materialsysteme an, wobei das quaternäre System W-Fe-Ti-O im Fokus der Arbeiten stehen wird. Bisher wurden nur die binären Metalloxide Titandioxid (TiO2), Eisen(III)-oxid (Fe2O3) und Wolframoxid (WO3) untersucht. TiO2 besitzt die besten katalytischen Eigenschaften, wohingegen die Bandlücke von Fe2O3 die umfassendste Ausnutzung der von der Sonne eingestrahlten Energie erlaubt. Von einer Kombination dieser drei Verbindungen versprechen wir uns die Entdeckung eines neuen Materials, das sowohl ausreichend Licht des sichtbaren Spektrums absorbiert als auch stabil gegen Korrosion ist und eine Bandlücke aufweist, die die Wasserspaltung ohne äußere elektrische Spannung erlaubt. Der obige Artikel ist in der Zeitschrift RUBIN: RUB »RUBIN Sonderheft Werkstoff Engineering » Beitrag 4 der Ruhr-Universität Bochum erschienen, hier der Link zum PDF-Dokument. Die Materialwissenschaftler der Ruhr-Universität Bochum sind im fakultäten- und disziplinenübergreifenden Materials Research Department (MRD) organisiert. Das MRD ist eine Plattform für die wissenschaftliche Kooperation sowie eine Schnittstelle der RUB-Materialforschung nach außen. Das MRD unterstützt die Materialwissenschaftler an der RUB bei interdisziplinären Forschungsprojekten: In den Jahren 2009 bis 2010 konnten z.B. durch Mittel des Landes NRW die Forschungsinfrastruktur weiter verbessert sowie kooperative Projekte zwischen verschiedenen Arbeitsgruppen durch Finanzierung von Postdoc-Stellen initiiert werden. Eines dieser Projekte befasst sich mit der solaren Erzeugung von Wasserstoff. Um in diesem Forschungsgebiet erfolgreich arbeiten zu können, kooperieren die Forschungsgruppen von Prof. Dr. Alfred Ludwig (Institut für Werkstoffe, Fakultät Maschinenbau), Prof. Dr. Wolfgang Schuhmann (Lehrstuhl für Analytische Chemie; Fakultät für Chemie und Biochemie) und Prof. Dr. Martin Muhler (Lehrstuhl für Technische Chemie; Fakultät für Chemie und Biochemie). Andere Projekte befassen sich mit Hochtemperaturmaterialien oder der Integrität kleinskaliger Systeme. Geowissenschaftlern ist es gelungen, mit Hilfe einer neuen Untersuchungsmethode die Eisbedingungen der letzten 30.000 Jahre in der Framstraße, einer Meerenge zwischen Ostgrönland und Spitzbergen, zu rekonstruieren.